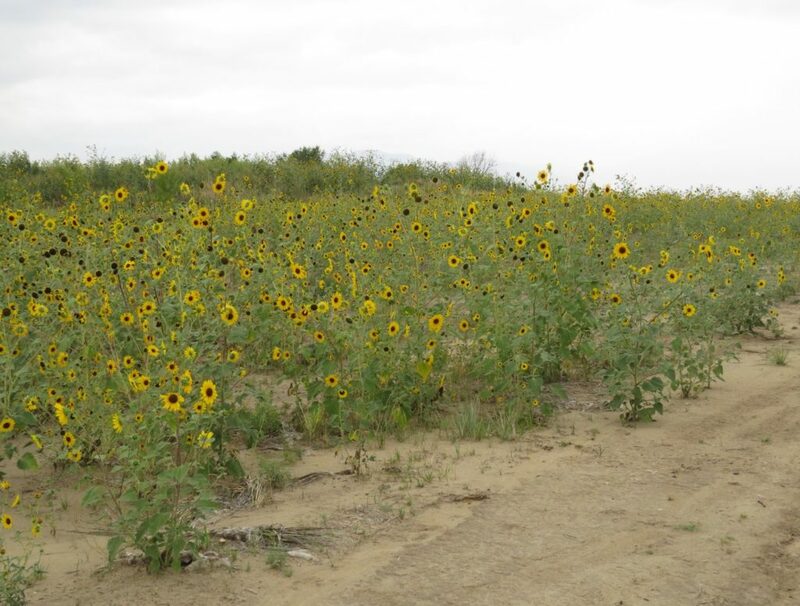 Few plants in arid climates can compare to sunflowers (Helianthus spp.) in their attractiveness to insects. Notice I said “plants” instead of “flowers.” That is because while the sunflower blossoms are a beacon to bees, many other kinds of insects find secretions from the buds, stems, and leaves to be irresistible, too. It is actually the sunflower’s phyllaries (the bracts forming the involucre or the head or inflorescence of a composite plant), and the base of leaves, where the extrafloral nectaries are located. They produce a sweet substance different from floral nectar that insects crave. 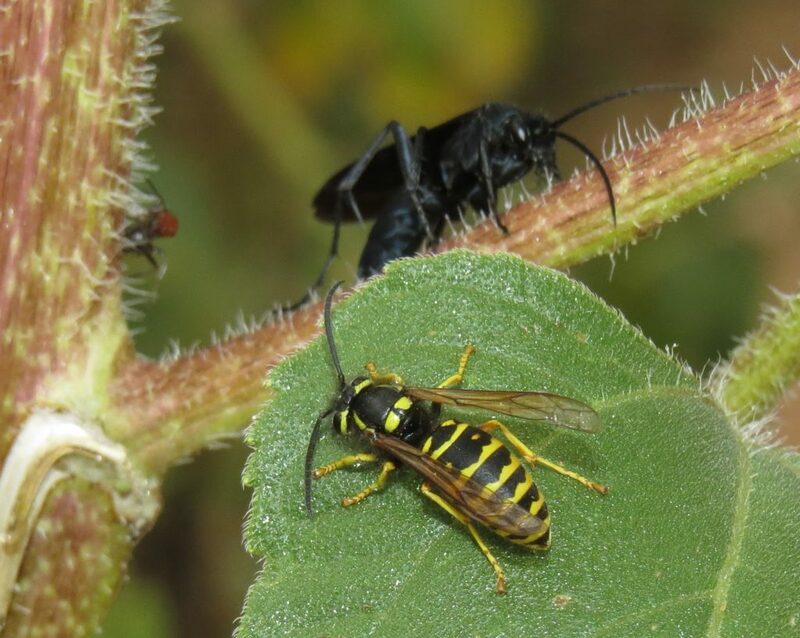 The main function of extrafloral nectaries (EFNs) is strongly suspected to be a means of recruiting insects to defend the plant against herbivores. Indeed, ants are the primary visitors to sunflower ENFs, and they vigorously pursue and rout any and all competitors. Ironically, ants are also “farmers” of aphids, scale insects, and treehoppers that produce their own sweet product called “honeydew.” Ants tenderly stroke these other insects until a drop of liquid waste appears at the rear end of their aphid or ‘hopper “cow,” and the ants eagerly lap it up. 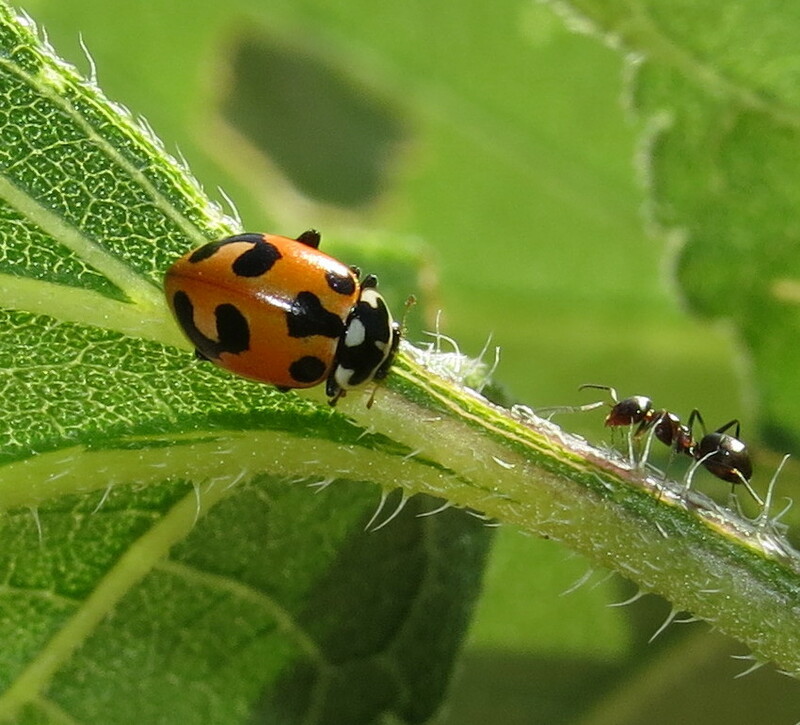 The aphids, scales, and treehoppers naturally manufacture honeydew as a by-product of their feeding activities….on the sunflower plant. So, while the ants guard the extrafloral nectaries, they also guard some of the insects doing the plant harm. Apparently no ecological relationship is perfect, but given the abundance of sunflowers, this one seems to work out ok anyway. Even lady beetles utilize the ENFs as a source of hydration and vital nutrients during the summer months when there is a significant dip in aphid populations. I have seen several species on sunflower while looking for wasps. 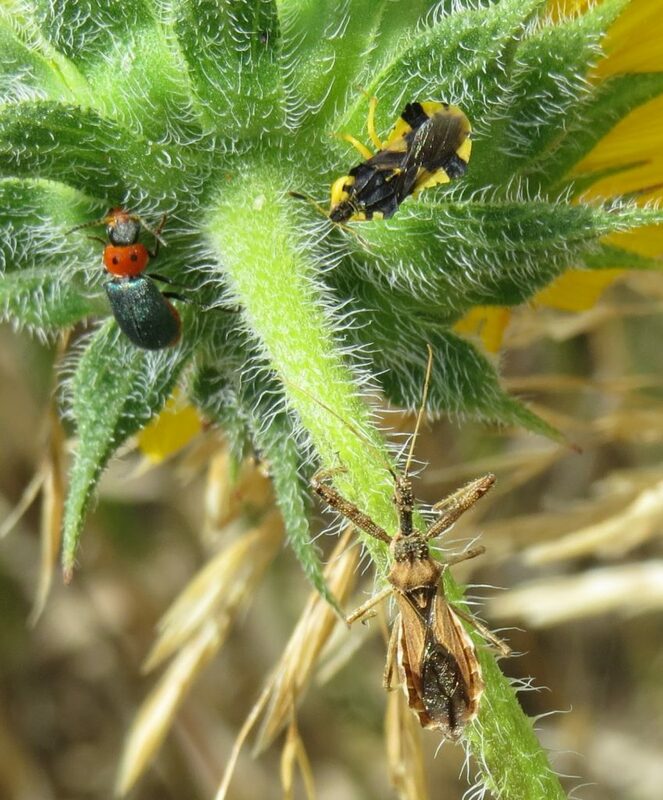 Other predatory insects recognize the lure of sunflower ENFs, too. Ambush bugs, Phymata spp., occur in abundance, and their success is measured by the many limp-bodied moths, butterflies, bees, and wasps dangling from their short beaks, or flopped across leaves below them. It is the wasps, though, that are most astounding in their sheer diversity. 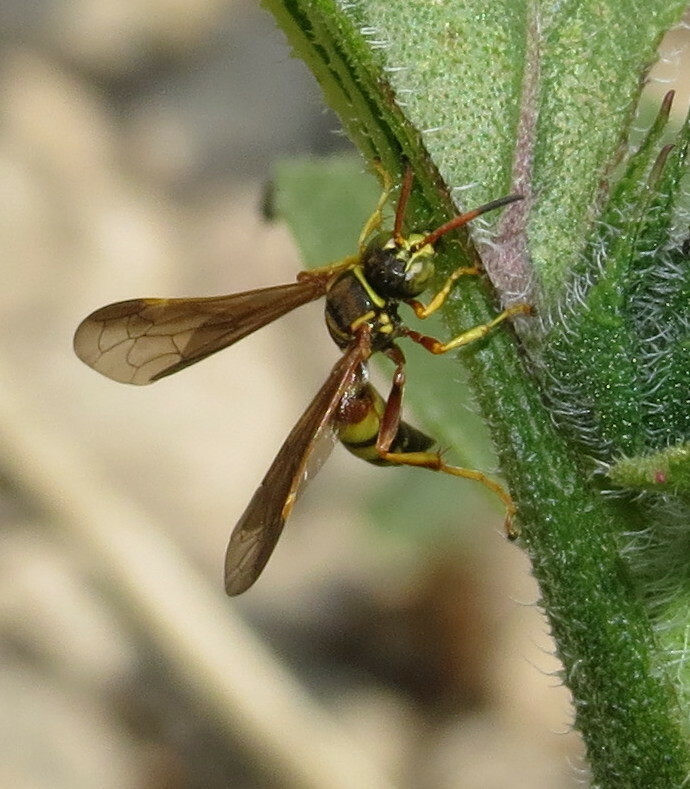 I have found almost every conceivable family of wasps visiting sunflowers, and a high degree of diversity within each of those families in many instances. 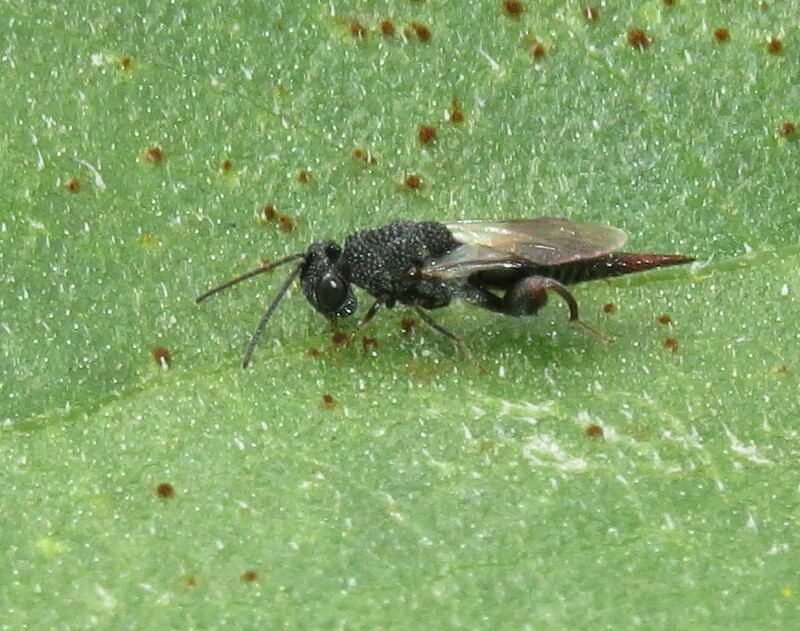 Tiny chalcid wasp, Trigonura sp. 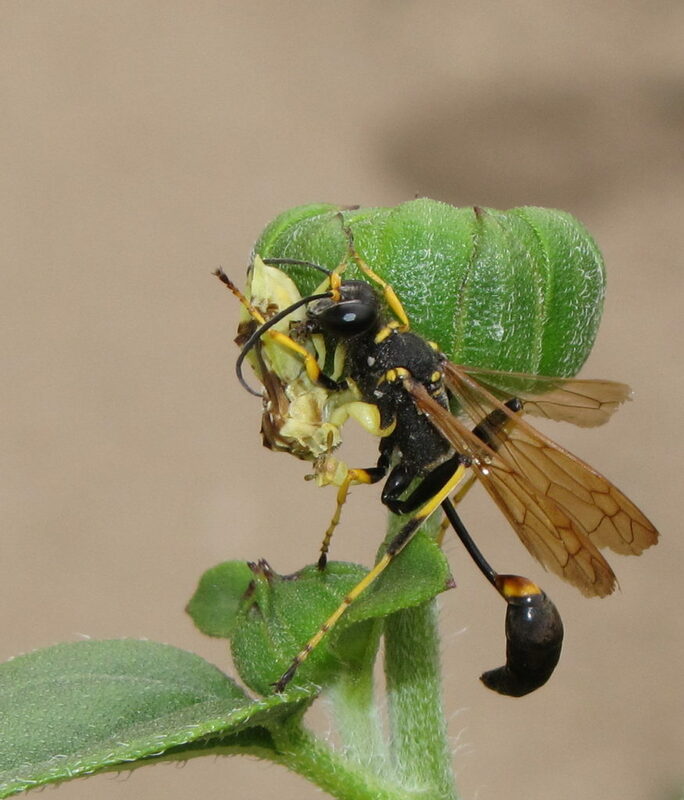 From the most minute of parasitic Chalcidoidea (a “superfamily” that contains several families of wasps) to large spider wasps and mud daubers, they are all there. 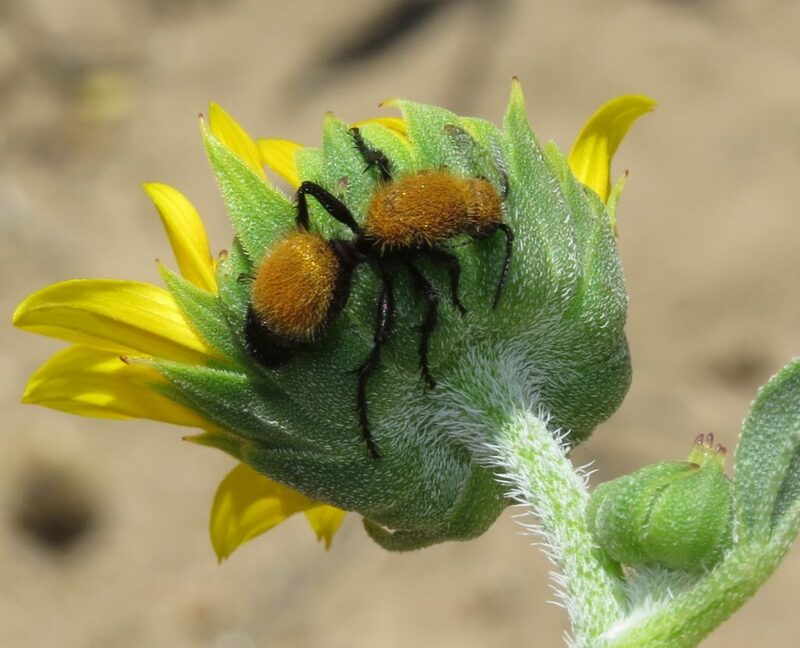 Even female velvet ants, wingless wasps which one usually sees scurrying across the ground, will scale tall sunflowers to reach those EFNs. Male velvet ants are even more frequent visitors, of course, with their ability to fly. 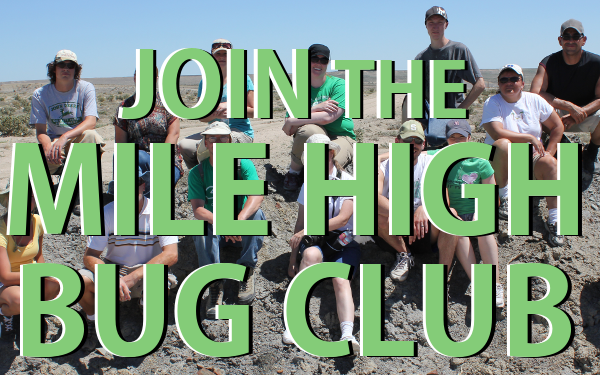 Some individual plants are indeed tall, surpassing six feet in height. Those are mostly the Common Sunflower, Helianthus annuus. 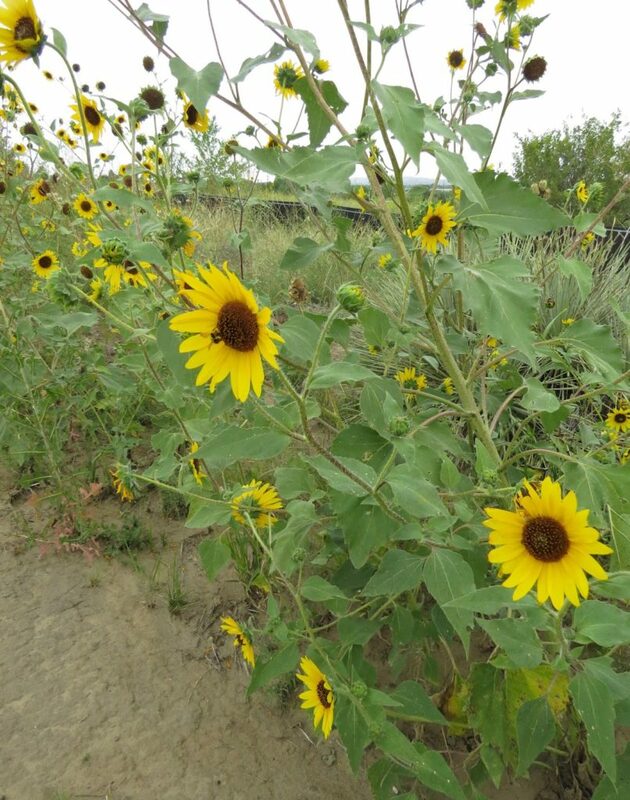 Locally, we also have Prairie Sunflower, Helianthus petiolaris, which is usually shorter, with purplish stems instead of yellowish green, and smaller, darker leaves. The density of sunflowers in a given area can be mind-boggling as well. 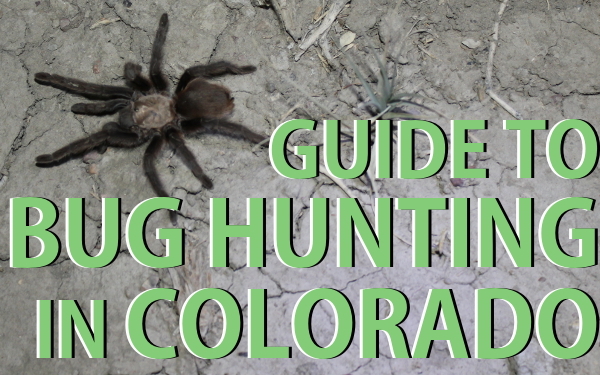 They thrive in “disturbed” habitats with sandy soil, which qualifies them to take over most of the urbanized Front Range here. 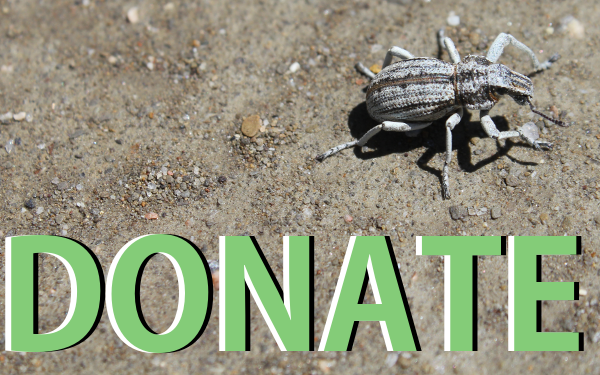 Despite that, insects are noticeably attracted to only a few individual plants. So, once I find an attractive plant swarming with insect life, I stand by and watch as various wasp species come and go. Not a fan of wasps? No worries, a wide variety of bees visit the flowers, especially bumble bees, longhorned bees, leafcutter bees, and various cuckoo bees. 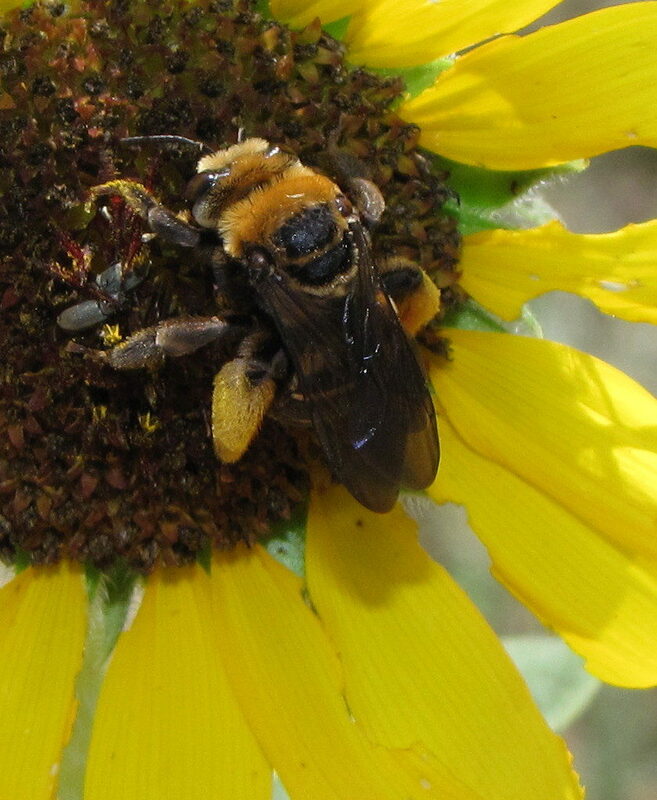 Some bees, like Svastra obliqua, are even sunflower specialists. Composite flowers in general are bee magnets, but the very large surface of sunflowers gives bees plenty of bang for their buck in pollen and nectar. Sunflowers also bloom continuously for many weeks, even months, like a seemingly endless fireworks display. 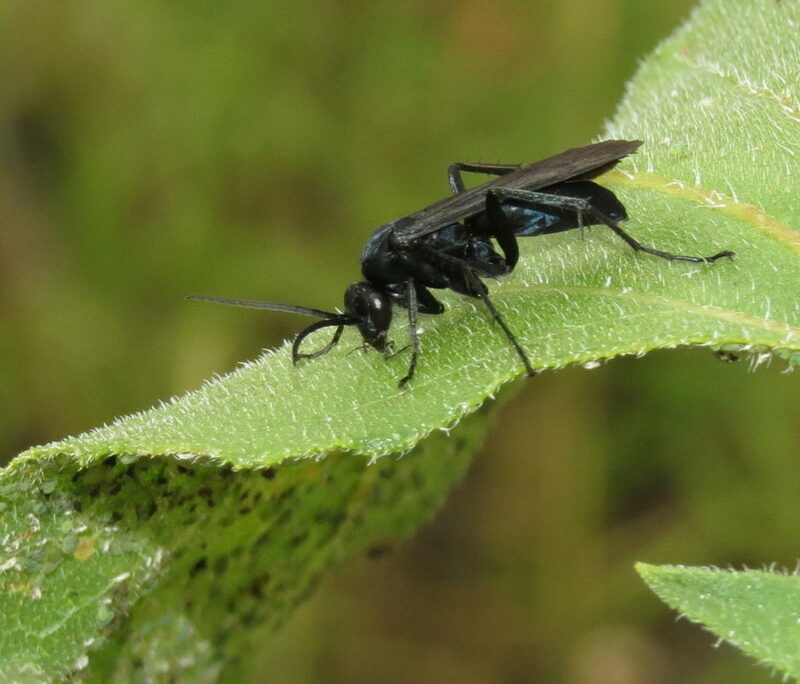 Blue-black spider wasp, Anoplius sp. One could literally write a book about all the insect visitors to sunflowers. Hm-m-m, that gives me an idea…..Meanwhile, enjoy the spectacle yourself next time you are in sunflower country. Sources: Hodek, Ivo, Helmut F. van Emden, and A. Honek. 2012. Ecology and Behaviour of the Ladybird Beetles. UK: John Wiley & Sons. 561 pp. Keeler, Kathleen H. 1979. 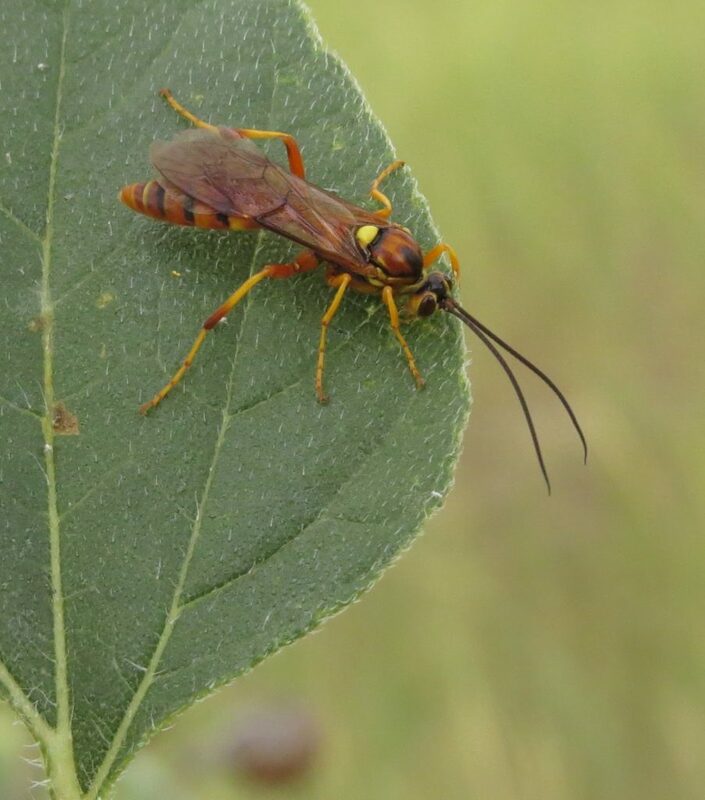 “Species With Extrafloral Nectaries in a Temperate Flora (Nebraska),” Prairie Naturalist 11(1): 33-38. Mizell, Russell F. 2015. 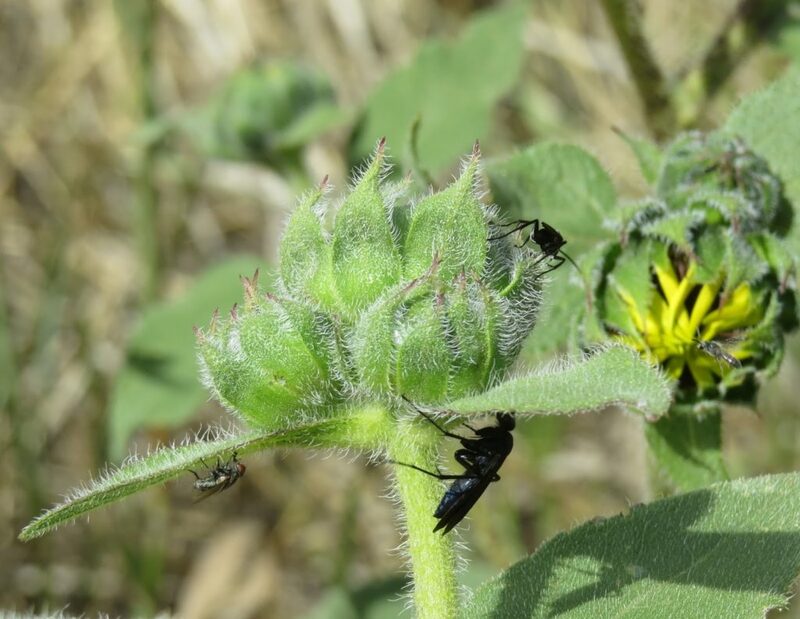 “Many Plants Have Extrafloral Nectaries Helpful to Beneficials,” EDIS, Institute of Food and Agricultural Scienes (IFAS), and University of Florida Extension, Publication #ENY-709.